The Adventures of Tioga and George: Where Is It Written? Yesterday was a very long workday for me. I was enjoying my cabinet building project sooooo much, that the time just slipped by. Because the weather was kinda chilly, Box Van's big door was closed. Working inside Box Van with that big door closed keeps me out-of-touch with the passage of time. The thing that got me to stop working on the cabinet drawers was being tired! Not the time-of-day. Anyway, I turned in to bed around 9 pm [Kinda early for me]. And now it is early morning and I am just about to head over to 24-Hour Fitness - Balboa! Where is it written that we must do things like sleeping or exercising at a certain time? After Denny's, I went to 24-Hour to exercise. But I was cold and went to soak in the hot spa. After the spa, I was really sleepy. So, I returned to Box Van to go back to bed! I just woke up and am preparing to go back into 24-Hour to workout. 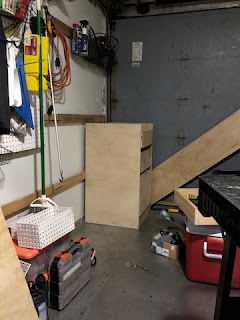 All day today, I've been struggling to finish my first cabinet. It has been 19-years since I last worked in a cabinet shop. I have forgotten a lot of stuff. Because of what I recalled while doing my first cabinet today, assembling my second cabinet tomorrow should be much easier to do! There is/was a restaurant (Ricky's Restaurant) on Hotel Circle (2181 Hotel Cir S, San Diego, CA 92108) that had the best Apple Pancakes. While attending classes at Naval Training Center I would go there every week and order them for dinner. They took a long time to cook so I drank my coffee and reviewed my notes for the week. I did very well on the test the following morning. I looked it up on google for the address and there are some entries that state it is closed. If true, it is a very sad thing. The pictures looked even better than I remember. That sounds like a wonderful memory for you! Thank you for sharing. I do not believe that I have seen a comment from you before. Are you an RVer? We have been RVing with a trailer for 12 years. Not full timers, or part timers, but we are some timers. We do our own trips some times, but more often go to Escapee Rallies or SMART musters in California and Nevada. We have also done National and Regional Escapee and SMART rallies in the West. Been a very long time since you have last commented! PS: Get yourself a Google ID if you wish to comment here. I have gone to The Original Pancake House several times. Now I am going to return for your suggested Apple Pancakes! I'll Blog about it when I do! Hello George, interesting build, have you considered cutting the tongue and removing the axle off the Scampi and loading it into the the box truck? You would have your steath truck and your beloved Scamp. You make BIG joke? Yes? Now being retired & widowed, if there are a bunch of old movies on TCM..or if a swell meteor shower is forecast I'm watching! I then turn the phone off and take a nap.. Birds of a feather, hang together! There is an important reason why making storage cabinets before building my living quarters is necessary. The space where my living quarters are to be built is now occupied by all the stuff that I am building storage cabinets to contain. I suppose that I could have off-loaded all that stuff into a storage rental. Then build my living quarters unencumbered. Also, if I were uncomfortable with not having enough warmth because my Olympian Wave3 Catalytic heater did not produce enough heat, I could buy a Wave 6 or even a Wave 8. But I sure understand why you would want your living quarters first! Somebody publishing a story about when and how to exercise is not one that is written in stone. Also, and very important, the negative aspects of not doing what this writer states is best may be marginal. I myself do not pay much mind to such stories. My experience is, that what is important is JUST DOING IT not when during a day exercise is done.